Celebrate an upcoming birthday with this fun and memorable Birthday Photo Personalized T-Shirts. This Birthday Personalized Shirt is just one of the many fantastic Birthday Gift Ideas you can give! 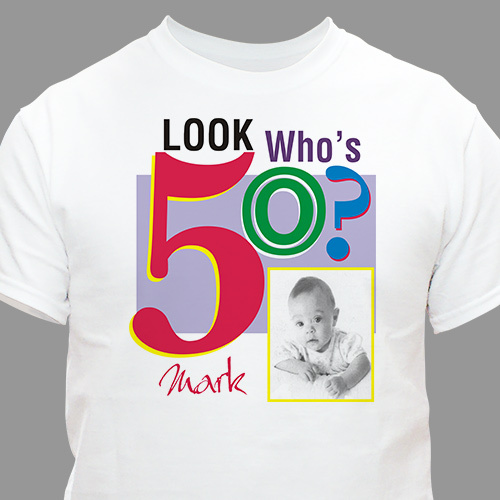 This birthday design is printed on our 100% cotton, machine washable t-shirts in adult sizes S-3XL. Free personalization of any age, name and photo is included. Just simply upload your favorite digital photo below. For production purposes, please enter a description that best describes your photo. Pretty nice picture quality. T shirt material OK.
My son was greatly pleased with the T-shirt & wore it immediately out to dinner with family. Additional Details Personalized Birthday T-Shirts make a unique way to celebrate someone's special day. Shop GiftsForYouNow.com for all your Personalized Birthday Apparel gifts.